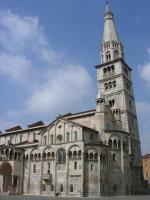 The Cathedral, Torre Civica and Piazza Grande in Modena are a group of romanesque structures from the 12th century. Religious and civic values were combined into this complex. The public square around the cathedral was designed to house administrative buildings, workshops et cetera. Modena Cathedral was one of the first buildings where an architect (Lanfranco) and a sculptor (Wiligelmo) worked together. Unusually for medieval tradition, their names were mentioned as the creators. Ancient remains were reused in the rebuilding of the cathedral from 1099. Its facade and side portals are richly decorated with sculptures. The interior, including a 12th century rood screen, is also well preserved. Modena's 85m high bell tower Ghirlandina can be seen from afar. So we noticed right away that it is hidden under construction material at the moment. Unfortunately that also proved to be the case for large parts of the Cathedral. Only the Preda Ringadora (from where orators spoke to the public) was completely visible (though easily overlooked). We first settled down for a cappucino at the Piazza Grande, trying to get over the disappointment. The square itself I found not nearly as impressive as I had imagined it. The other buildings look plain, and have been taken over by various commercial companies. The cathedral and its tower are the real landmarks here. The interior of the cathedral and its museums were closed too. We had to make do with a slow circumambulation of the famous cathedral. Both facades in the front and the back were still visible, as well as the Porta della Pescheria with its very early carvings of a King Arthur scene. These reliefs and fine sculptures are what this Cathedral does stand out, and fortunately some were still left out in the open to admire. After many years of renovations, this site is finally accessible again. I first went to Modena in April 2011, only to find the cathedral and the bell tower completely covered in scaffolding - 6 months after the original due date that was still posted on the site. A second visit in October 2013 finally enabled me to see more than just the piazza (a nice one with an impressive Town Hall, but nothing outstanding - not sure why it is specifically mentioned in the WH name). The bell tower is completely renovated and also fully accessible - I did the climb up to the top to enjoy a nice view of the city. Except for a small part of the façade, the cathedral is also fully renovated and can be visited again. I went inside only briefly, as there was a Mass going on, but I'm still glad that I could finally tick off this site. 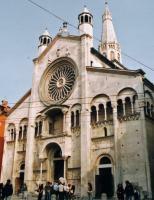 Modena is easily accessible from Bologna and Milan, and the train station is quite close to the city centre. It's not a city where I would spend more than a day, though. I visited this WHS in September 2006. 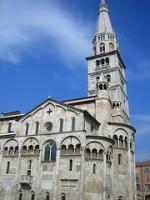 The main square with the cathedral and tower is a great example of early Romanesque art. The rose window was the highlight of my visit coupled with the divine buffet and wine-tasting in a nearby restaurant. Salute! I visited Modena on February 23 and 24, 2012 and guess what? The outside of the cathedral is still covered with scaffolding. The inside, however, is quite impressive, with its high altar and the variety of sculptures, columns, and brickwork. Unlike many churches in the area, it has been spared most of the "updating" from style to style over the years so even the neophyte art historian can get a sense of the Romanesque style without the distraction of Renaissance, Baroque and modern "add-ons"
The city itself has a small historical district which is pleasant enough but pales in comparison to the porticos of Bologna and the streets of Parma. However, do plan to have at least one meal here--the food is some of the best in Emilia-Romagna. I'm Italian (from north Tuscany) and I've visited most of the historic centres of northern Italy medieval towns. I reached Modena only because is on the List and, after visiting, I could say that this is, by far, one of the most poor and totally overrated WHS. The Duomo is nothing special, very small and under refurbishment by decades, although the inside is nice (and free, not so usual in Italy). The Piazza is one of the ugliest of italian's "comuni": there is NOTHING, not even a nice Town hall, so common in this part of Italy. 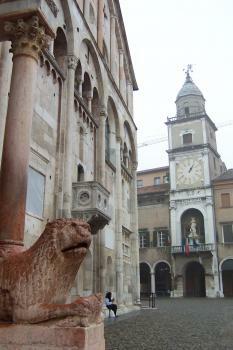 For me it was a short ride from home, but for foreign visitors, allow maximum half an hour to visit Modena. In conclusion, I still don't understand why that church and that piazza are on the list, assuming that Lucca, Parma, Sarzana, Pietrasanta ect. are, by far, more impressive and with more historical and architectural significate. 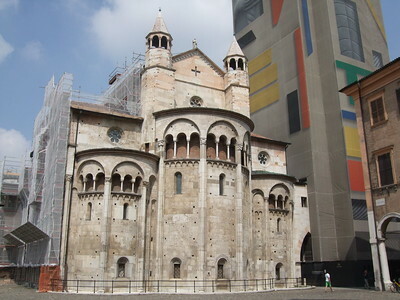 I have been many times in Modena to visit the beautiful cathedral, a stunning Romanesque masterpiece built under the family Canossa, from 1099 to 1184, on the project of Lanfranco, and modified by the Masters Campionesi from 12th to 14th century. It is made of Istrian stone to appear like an ancient temple and has on the façade and on the side walls embedded semi-columns linked to arches with arcades below, small columns, cornices and blind arches, all decorated with sculptures. The six portals along the wall have open lunettes and architraves and four of them are preceded by a two-storeyed canopy, supported by lions. The tripartite façade has pillars surmounted by octagonal canopies and a big Gothic rose window between them. The sculptures on the central and lateral portals, inspired on the sacred play of “Adam’s game”, made by Wiligelmus, suggest the promise of the salvation to the faithful, especially in the climbing stems decorated with figures of people and animals and fantastic creatures of the bestiaries, in the moulding of the intrados and in the jambs of the central portal, with figures of prophets, and in the frieze, with the events of the Genesis in four groups. The southern Princes’ Portal, dedicated to the New Testament, was sculpted by a master of Wiligelmus’s school, the Master of the Prince's Portal, with peopled climbing stems on the intrados, the twelve Apostles on the jambs and the story of the journey of St. Geminiano (on the architrave) to Constantinople to cure the Emperor’s daughter, the return to Modena and the death. Near that is the Royal Portal, sculpted by Anselmo da Campione, a pulpit and a relief made by Agostino di Duccio. The northern Portal of the Fish Market, made by the Master of the Fish Market, has a representation of the legend of King Arthur attacking a castle in which the Princess Guinevere is held prisoner, a climbing stem motive and a representation of the twelve months with their characteristic works on the jambs and humorous tales on the architrave. There are also subjects superimposed and located beneath the arches, later placed on the columns of the portals for the prophets and apostles and on the jambs or the plinths for the months. The bell tower Ghirlandina, built in Istrian stone and linked to the church by two arches, consists in six floors with small blind arches lit by openings and by two and then three windows on the upper floors. The Romanesque bottom half, projected by Lanfranco, is surmounted by an octagonal Gothic drum and a lantern, projected by Masters Campionesi. The interior, projected by Lanfranco and modified later, made of bricks (with also zigzag frets in the main arches clad in pointed brickwork as decorative motif), consists in a nave on which opens a gallery and tall windows, two aisles and a choir with a presbytery, that has a balustrade with a double row of columns, above a crypt, with nice Romanesque capitals, ending in three apses; the arches are supported by alternating supports with pillars and marble columns with Corinthian capitals, sculpted by Wiligelmus, and there are also semi-circular transverse arches and broken vaulting in the side aisles. The Masters Campionesi made the rood screen, built for the consecration of the church by Pope Lucius III, that has telamons, lions and in part polychrome relieves with five scenes of Christ’s Passion on the parapet, the ambo, that has figures of the Fathers of the Church and symbols of the Evangelists, the false transept, the groin vaulting of the nave, the frescos, the facing painted to resemble brickwork, on the arches, the pilasters in the bays and the disappeared friezes. In the cathedral are also two Roman capitals used as stoups, a pulpit, an altarpiece with relieves and frescos by Cristoforo da Modena, the sarcophagus of St. Geminiano (4th century), an old crucifixion, tarsia by Cristoforo da Lendinara, Renaissance paintings by Serafino Serafini and Dosso Dossi and sculptures, often in terracotta, by Antonio Begarelli and Guido Mazzone. The small Lanfranco Street was built on the northern side of the cathedral after the demolition (18th century) of the chapter buildings situated around a cloister and overlooks on it the Cathedral’s Stonework Museum, the chapter’s archive and the sacristy, linked to the cathedral by an elevated passage. The quadrangular Big Square (Piazza Grande) was built in the 12th century along a side of the cathedral. The old and new town hall were modified by connecting of the clock tower (13th to 16th century) and blending with new façades and arcades (17th to 19th century); inside there is the Fire Hall, with frescos by Niccolò dell’Abate. Ahead it is the women’s statue Bonissima, symbol of the administration which was responsible to trade, and the Pietra Ringadora, a pulpit used by orators to speak to the people. The Archbishop’s Palace, made of bricks and linked to the cathedral by a private passage, was modified in the 15th century and a floor was added in the 17th century. The Law Courts, built by Giò Ponti in 1960, replace the building projected by Luigi Giacomelli in 1892. I liked very much this complex because of the quality of the architecture and of the decorations. It’s worth to be visited if you are in Emilia-Romagna but I think that only the cathedral justifies the inscription because the square is not outstanding. The Cathedral and tower sit on the Piazza Grande so they can all be seen in one go. The Cathedral is the main sight and is a fine piece of Romanesque architecture. The interior of the cathedral is quite impressive with sturdy walls, the interior splits to two levels divided by the impressive tribuna. There was a service going on below, so I was not able to get to see the coffin of San Germiniano to whom the cathedral is dedicated. There is a very impressive mosaic above filling the rear niche and providing a focal point for the cathedral. The Torre Civica is on the rear and is obviously leaning, it is accentuated by the lean in the opposite direction by the walls of the cathedral itself. It is possible to climb the tower but the opening times were a bit erratic. The Piazza Grande is included more for the cultural/ historical relationship than its impressive architecture as there were not any real buildings of note. Modena seems like a nice city, quite small but probably has enough to keep you there for a night if you wanted to go out and see Ferrari's factory at Maranello about 15km away. Modena is ideally situated on the main north south rail line between Milan and Ancona, or could make a nice day trip from nearby Bologna. While famous for its vinegar, racing cars, and tenors, it's the Romanesque Duomo and Torre that land Modena on the World Heritage List. They are considered to be among the finest examples of this period of architecture in Italy and justifiable so. Decorated with impressive reliefs along the facade and around the numerous doors, the Duomo is a 11th/12th century masterpiece, with most of the credit due to one Wiligelmus, a sculptor about whom still little is known. The Torre Ghirlandina is famous for its role in the centuries old rivalry between Modena and Bologna, involving the theft of a notorious and much-coveted wooden bucket. It is also notable for its beauty and its very obvious lean. 203 Community Members have visited.